All photos are not edited. They are taken straight from my Samsung S2. I have some family and friends who are asking me what I consume to have this flawless & Korean-like skin. 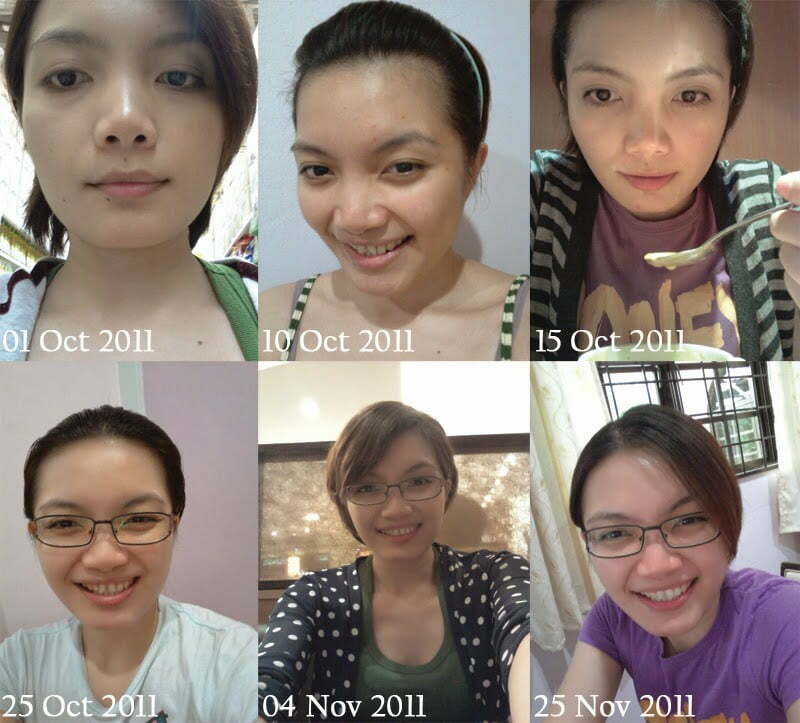 I started my beauty regime on 1st October 2011. Notice that I have eyebag, and so panda-like eyes. I also have a very sensitive skin which is very prone to acne. Thanks to Mei Mei for introducing me this serum (from Taiwan) & Kyusoku Bihaku Glutathione Activator plus NAC with Vitamin C Rosehips. I also apply facial mask before I hit the bed. KB is known for specializing in skin care which has over 10 products on its roster. The line is popular for bringing ingredients that have knacks in cosmetic and skin care industry. As makers partnered with biggest cosmetic laboratories abroad, they always assure each user that they followed the standards set by cosmetic and soap industry. With over hundreds of agents around the world, KB is continuously gaining clients’ trust. The KB capsules contain fish collagen peptide (200mg,) vitamin C (40mg,) cartillage extract (20 mg,) pearl coix extract (20mg,) silk peptide (10mg,) vitamin E (8mg,) CoQ10 (4mg,) birds nest extract (2mg,) pearl powder (0.6mg) and excipients such as: dextrin, cellulose, stearic acid, calcium and HPC. A great and flawless skin within 2 months! No. This is not a joke. I don’t go for Botox or Vitamin C injections. I started to love KB on my first week of consumption. I really saw quick results with my skin being whiter, smoother and glowing. Thank you so much, KB! Cheapest Whitening Pill in the Market. I can see the result as early as 2 weeks. Must drink lots of water. You cannot consume if you’re pregnant, or breastfeeding. You have to stop taking caffeinated, or alcoholic drinks. I found it’s pretty hard to get this from a reliable Malaysian’s online seller.